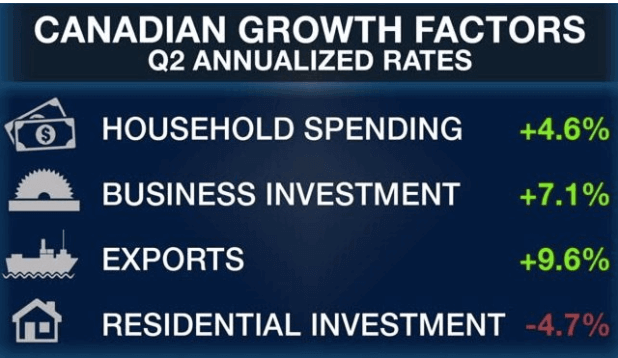 The Canadian economy accelerated at it’s fastest pace in nearly six years. GDP growth hit 4.5% in the second quarter of 2017, defying just about everyone’s expectations. Perhaps even more surprisingly was the large growth despite a significant drop off in residential investment which dropped 4.7%. Investment in residential structures also sunk 1.2%, which was largely due to a 6.7% drop in homeownership transfer costs as sales fall in Vancouver & Toronto. To no surprise household spending is up 4.6% as the ‘wealth effect’ from surging real estate prices continues to encourage more spending. Homeowners are drawing down equity at a record pace, as I wrote the other day, total Canadian loans secured against real estate is up 11% year over year. 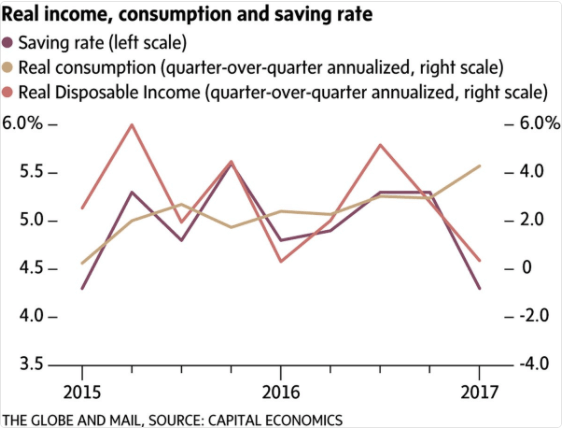 This phenomenon can also be seen in data from Capital Economics, which highlights a falling savings rate with an uptick in household consumption. Either way you slice the data, it supports the notion for further rate hikes. CIBC is now predicting that the Bank of Canada will increase interest rates another 0.25 basis points as early as next week. With the market currently putting it at 38% odds. Either a way if it doesn’t happen in September, October seems to be a sure bet.